Catawba County, located northwest of Charlotte, is strongly Republican territory. 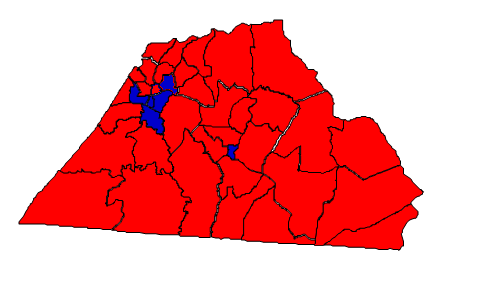 The county seat is Newton, but by far the biggest city within the county is Hickory, which is also the only place where Democrats consistently win. With a population of 154,358 people (2010 census) the county is also fairly populous, making it valuable to Republican victories statewide. Prognosis: From 1988 to 2012, Catawba County always had a narrow PVI of between R+25 and R+33. The political trends within Catawba are fairly stable. Republicans have a strong 13-point edge in voter registration, making the county out of reach for pretty much any Democrat. The last Democrat to carry Catawba County at the presidential level was Franklin D. Roosevelt in 1944. 86% of the registered voters are white. The county’s growth rate during the 2000s was 8.94%, fairly weak. There are no trends in the county worth noting. This has been part of the Republican ‘base’ in the state for over a century and will likely remain that way for a long time to come. Trivia: Cherie Berry, in the news for considering a Senate race, is from Catawba and represented parts of the county during her time in the State House. She is from Newton.